With the first bout of illness upon us we’re reminded of the importance of good nutrition to support the body and keep us performing at our best. The common cold affects most people at some stage during the year and can mean days off work / school and decreased productivity. Trying to run a household, respond to emails or study becomes much harder when plagued by headaches, congestion and a constant runny nose. Vitamin C is one of the first things we reach for when struck down by the common cold. Despite not being very effective at preventing a cold in the first place, vitamin C may be helpful in reducing the severity and duration of an existing cold. Hidden in the shadow of vitamin C’s popularity is zinc. Zinc is a mineral needed in very small amounts but has a central role in the immune system, and a deficiency in this essential nutrient may lead to increased illness and poor wound healing. It has been shown combining vitamin C with zinc is more effective in the therapeutic treatment of a cold – more so in children. Lean red meat is an excellent source of high bioavailable iron and zinc, as well as essential B vitamins. Our delicious Harira soup recipe provides over a third of an adults daily zinc needs – it’s also low fat and a good source of iron. Including lean beef and lamb 3-4 times a week, along with plenty of vegetables, will ensure recommended dietary intakes of iron, zinc, and other vitamins are easily met. 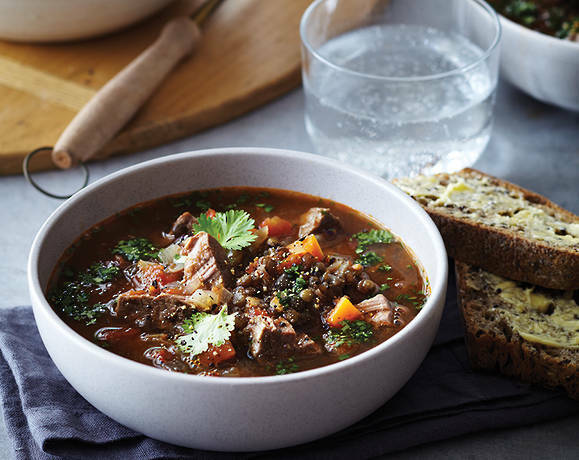 Check out some of our favourite soup / broth recipes below to warm up on a cold winters day.